When you hear the words ‘tax return’, your mind might automatically conjure the words ‘time-consuming’, ‘laborious’ and ‘stressful’. Many believe that the Self Assessment takes days and is only something a professional could do. But that’s not true. In fact, it can be completed in minutes – and by yourself. Here, we give you the four tips you need to file the tax return in no time. The figures and information can’t all be in your head – and it’s unlikely you’ll be able to remember long digits like your UTR number! This is given to you by HMRC and should be kept in a safe place. You won’t be able to complete your Self Assessment without it. This goes for the other documentation you need too. Loose files will be difficult to locate as the tax deadline 2019 approaches, so you’ll want to keep everything in a single place – ideally digitally rather than in paper format. You can retain all documents electronically, even those that weren’t originally provided to you in this way. Instead of scraping around for receipts in January, take and upload photos of them on the go for later reference. Perhaps you don’t have access to the documentation that HMRC require of you because you weren’t aware it would be needed. By knowing in advance the necessary documents, you’ll be able to easily collate all your information in one place throughout the year. Depending on your circumstances, you may also be required to give information on things such as benefits and any Income Tax losses. Do your research on what you will be asked, and you can provide your answers swiftly and correctly. Additionally, take the time to understand what actually counts as an allowable expense – many fritter away precious minutes trying to claim for things that aren’t permitted. One certain way you can waste time is to leave the tax return until the day of the Self Assessment deadline 2019. Whilst you can do it in minutes, that doesn’t mean you should. What will likely happen is that you will feel panicked and potentially submit incorrect information. As you’ll be fighting against the clock, you might not conduct a thorough check. An inaccurate submission can be met with a penalty from HMRC, so file as soon as possible. Remember: the Self Assessment deadline in the UK is 31st January. The best way of ensuring your tax return takes the minimum amount of time possible is to take advantage of Self Assessment software. 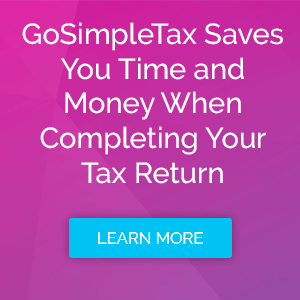 Tools like GoSimpleTax make those who aren’t tax experts proficient. You simply enter in your information, and it works out all the sums for you – adjusting instantaneously whenever you update any figures. You can keep all your information in a single place too, with the ability to snap expenses and upload them directly to GoSimpleTax. With our software, getting the Self Assessment filed before the tax return deadline 2019 will be easy. Register for a 14-day free trial, or sign up for an annual subscription to benefit from the full suite of features and quickly submit the return.